In 2004 in Atlanta, Georgia, we founded Amba Products with a clear goal in mind: to dispel the myth that, in North America, towel warmers were only for the rich and famous. Overpriced and not widely available, towel warmers in America, prior to 2004, could be seen only in the homes of some of the country’s elite. While Europeans, and other nations around the world, had been drying and warming their towels on radiators for years, most Americans had no experience with them. In fact, the perception persisted that they were a luxury out of reach for most American families. Amba Products changed this view. We’re proud to be one of the first companies in the U.S. to introduce consumers to affordable, stylish towel warmers made of high-quality stainless steel. And the news spread quickly! Initially supplying a handful of clients with top-grade towel warmers—we now proudly serve more than 2000 retailers throughout the United States, Canada, Mexico and the Caribbean. Constantly on the lookout for innovative designs, we get our products from all corners of the world. And by partnering with specialized manufacturers, we develop product ranges usually exclusive to Amba. That’s why our commercial and residential clients now have so many options to choose from: 150 towel warmer models and custom towel warmers from Italy, South Africa or China—all steeped in stylishness and quality. We keep our collections in stock and ship our products directly from Atlanta. What does this mean for our clients? No frustration and waiting for orders to be imported. When it comes to customer service, Amba is unmatched. Call anytime during office hours, and you’ll speak to a real person! No call centers for Amba! We see it as our duty to support our clients and to respond swiftly to consumer needs. As for energy conservation, Amba’s products are front and center. 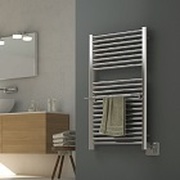 Our towel warmer collections provide efficient heat and yet, they use minimal energy to operate. Depending on the unit and its location, Amba towel warmers consume approximately the same amount of energy as a few light bulbs. And accessories such as timers and digital heat controllers make it easy to maximize energy savings. Safety is always top of mind for us at Amba. Our towel warmers meet stringent safety standards for the U.S. and Canada, and are perfectly safe to use indoors when correctly installed. Some collections come with an additional feature that enables the units to shut off automatically for optimal safety. Affordability continues to be as much of a priority for us as design and excellence. That’s why we go to great lengths to keep our products competitive. Whatever the budget, Amba has a top-notch product to match it. And there’s more to come! Keeping a close eye on new trends, changing tastes and emerging consumer needs—Amba Products is at the forefront of luxury living at reasonable prices. So what’s next? Look out for novel designs, cutting edge technologies and unique products from Amba! You won’t be disappointed. Stainless steel does not readily corrode, rust or stain with water as ordinary steel does making it the perfect material to help keep your towels nice and dry!